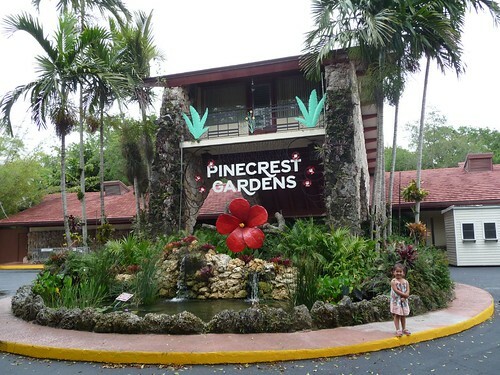 Mali Mish – Day 51: Pinecrest Gardens in Miami. 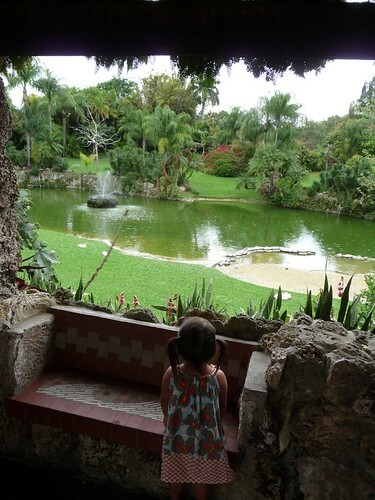 Day 51: Pinecrest Gardens in Miami. The forecast this morning called for thunderstorms in 80 degree weather. It is now definitely feeling like vacation weather with this high humidity. We were getting a quick fast food breakfast when it suddenly started pouring. It came down so fast and so hard, we didn’t even want to chance getting drenched running across the parking lot to our car. 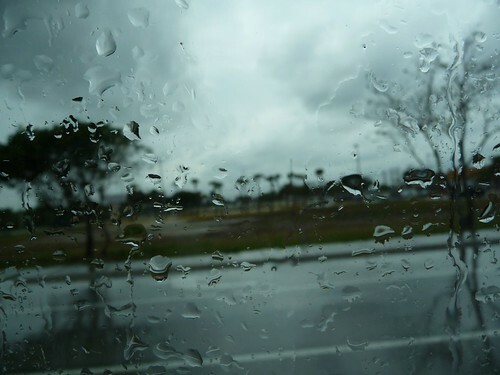 The rain after that was sparse and sporadic throughout the rest of the day. Since we knew it was going to be wet pretty much anywhere outdoors, our original plan was to go to the Miami Children’s Museum. It is off of the MacArthur Causeway just a few miles short of South Miami Beach. From our campground, it is a good 25 miles away. Unfortunately, the traffic was so bad getting there that we barely made it 10 miles in over a half hour. Rather than spending hours of our day on the road, we called an audible and decided to head to a little place called Pinecrest Gardens recommended to us by a new Facebook friend from the area. Thanks Leah! 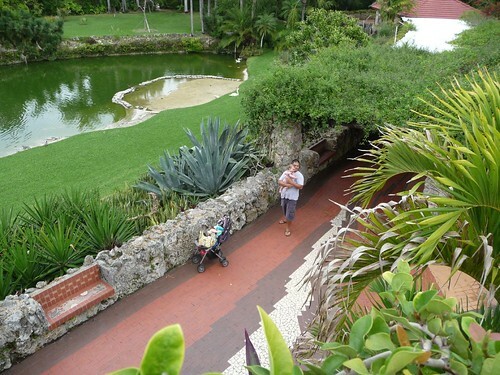 Pinecrest Gardens is a secret little gem that probably most visitors don’t hear much about. We sure didn’t know about it. 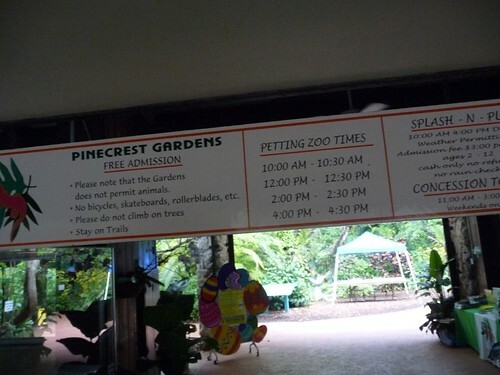 The best thing about it is that it is free except for the splash-n-play area or on special event days. Since it was a Friday and rain was in the forecast, this place was deserted. We did not see hardly anyone else there the entire time. We felt like the Griswalds in Wally World. 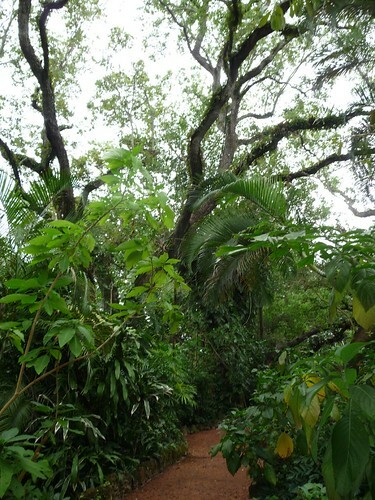 The landscape is very lush and beautiful as you walk through the garden. 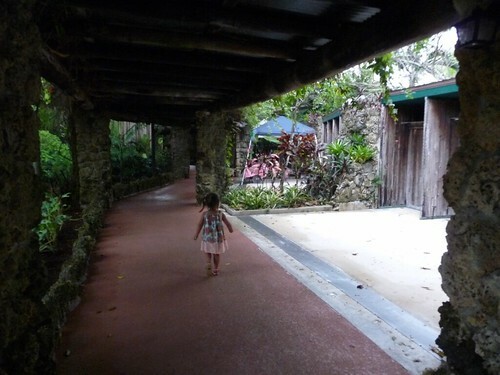 The jungle-like surroundings along with us being alone in the park made it a little spooky as you walk through little pathways like these. Along with the large variety of plants, there are also some wildlife in the park. Around this pond in the middle of the place there are ducks, geese, swans and even lizards lounging around. 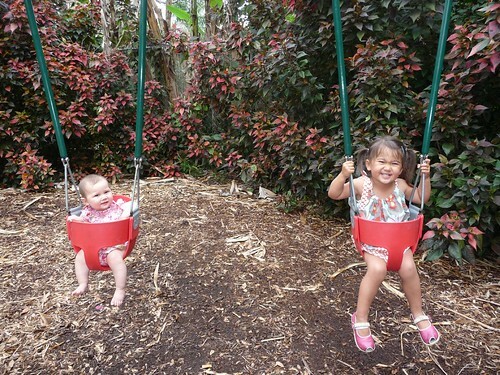 We found a playground with a swing set that the girls played on since hardly anything was open due to the rain. During our walk down one of the paths, we stumbled on a little surprise. 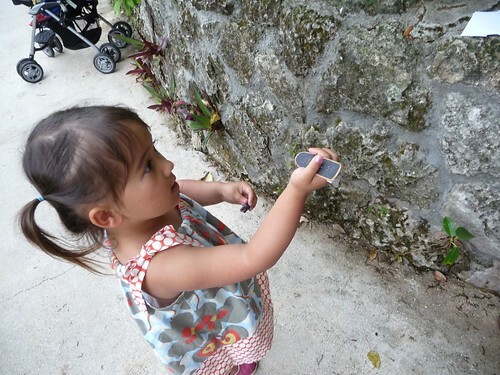 A Geocache! We are not really geocachers but I know well enough about the hobby so we dug this old, surplus ammo box out of the pile of rocks it was under. 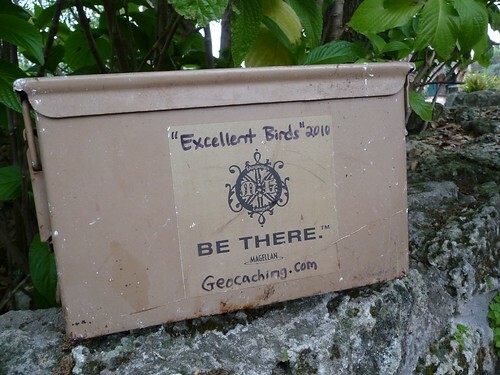 The “Excellent Birds” 2010 Geocache. 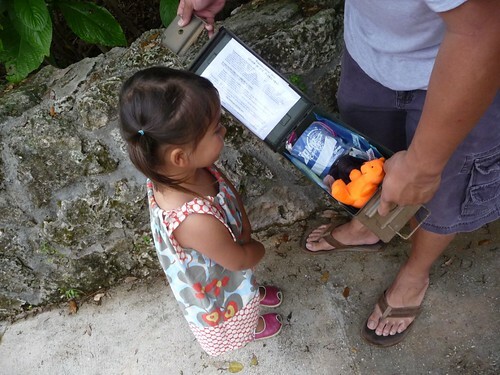 As all other geocaches, there are a bunch of objects people have left in the box along with a little log book. 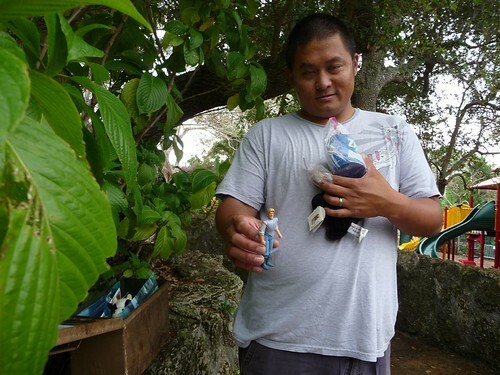 You are welcome, even encouraged to take something from the cache as long as you replace it with something of your own. 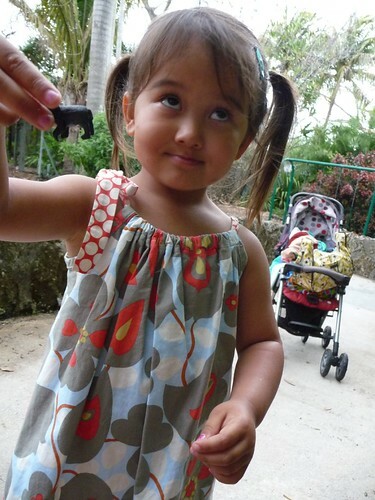 We asked Ava if she wanted to trade any of her toys with what is in there, she reluctantly presented a little dog doll her uncle Deets gave her that Marlene has been keeping in her purse as a back up emergency toy. How about this little skateboard? Wanna trade your dog for it? What about this prince looking dude? I think he is from a Disney something-or-another! Among all the little knick knacks in the box, I found a stack of Skilled Fencing business cards. I give them credit for doing some creative advertising but it is a little annoying to find someone trying to capitalize on a not-for-profit activity for the community. Next to the park was a petting zoo with pigs and goats. It was suppose to open a few times a day but I guess since no one was there besides us, they didn’t bother letting them animals out. Sorry Ava, the best we can do is to watch them through the fence. 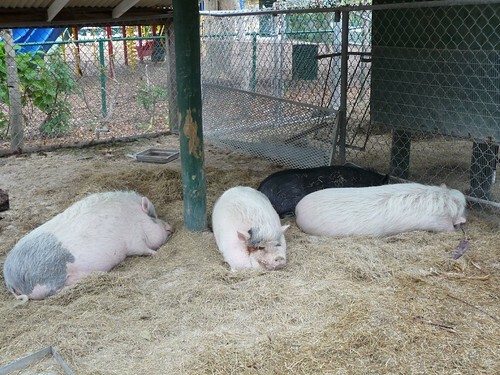 The pigs didn’t seem to care much. 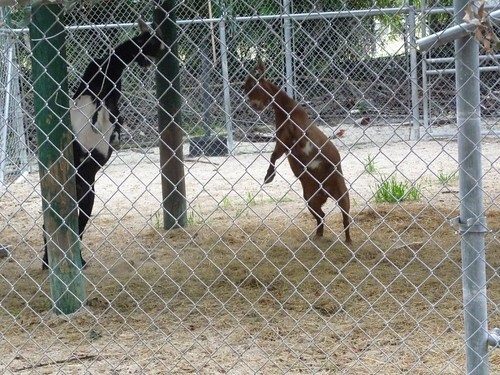 But the goats on the other hand, looked like they were taking out some of the frustration on each other. 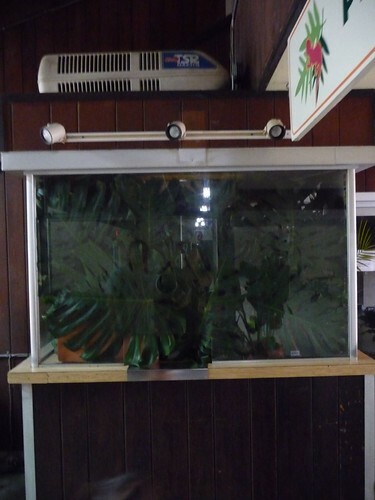 This is the ticket booth. It must get pretty hot here since it has its very own RV-style AC unit under the maintenance and repair services warranty right on top of it. Right by the front gate there is a koi pond with some very colorful schools of fish. 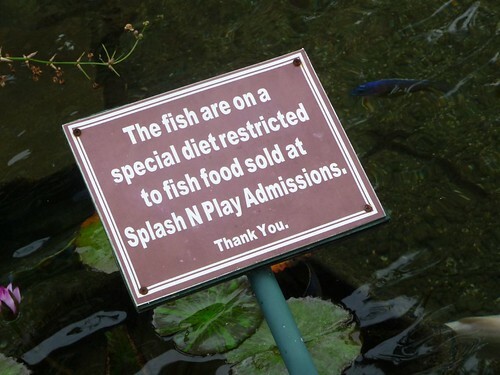 They must have been starving today since the Splash-N-Play area was closed and no fish food was being sold. 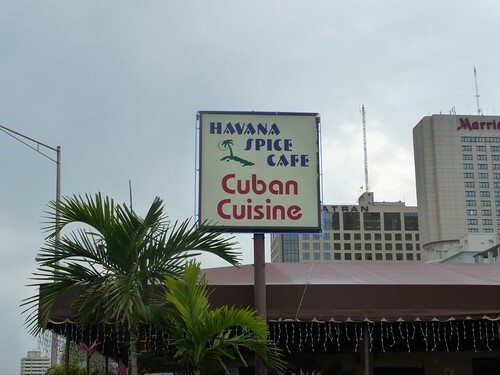 We on the other hand, we did not let the fish’s special diet get in the way of us trying some Cuban cuisine. We found Havana Spice Cafe down the street from us thanks to the Yelp app on my phone. It came with some pretty high ratings so we were excited to try it out. This is where Mila made her very first high chair debut. With her being able to sit up so well now and her other ride in the shopping cart earlier this week, she has now been upgraded to her own seat at restaurants. 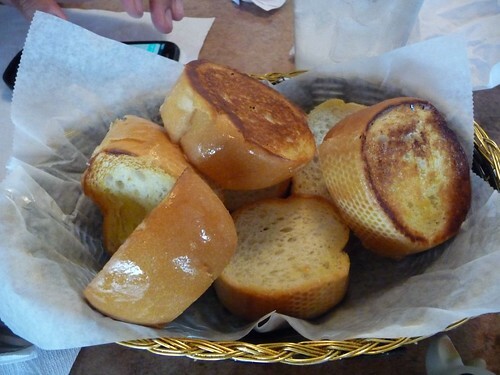 Here is some authentic Cuban bread that came with our meal. Our meal was a smörgåsbord of meats and sides. I won’t say that it wasn’t good, but I didn’t think it was anything special. 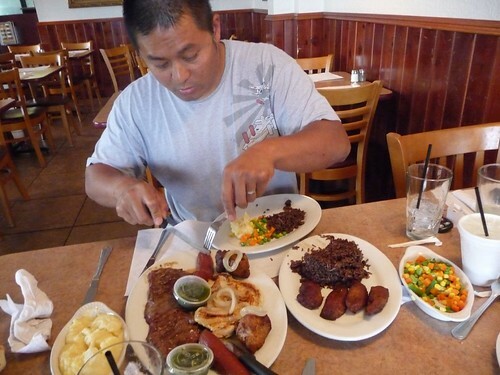 Actually the beef steak was so tough and chewy the girls wanted nothing to do with it. 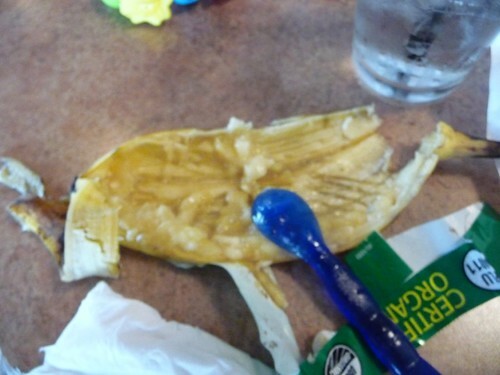 Mila had her own little meal on her own today with some mashed up organic banana. We were surprised that she ate pretty much an entire banana all by herself. 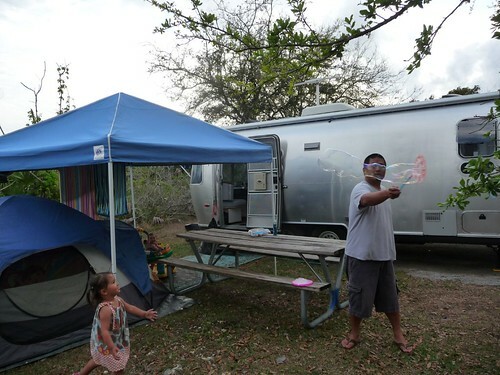 We headed back to the campground and Ava enjoyed the rest of her day making bubbles with me and popping them. Guess who else got to come out for the afternoon? Yoda! She pretty much stayed in this crouched position the entire time. Don’t worry Yoda, there are no panthers here. At least none that we know of. Day 50: Larry and Penny Thompson Campground. Day 52: South Beach, Miami. 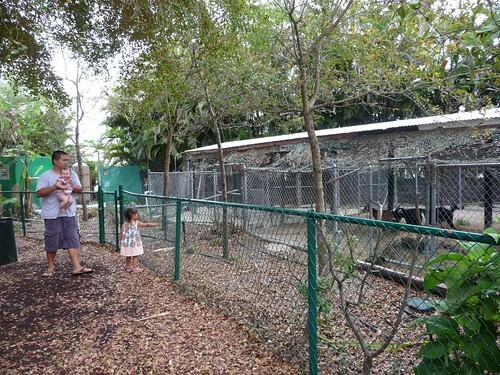 4 Responses to Day 51: Pinecrest Gardens in Miami. Yoda looks a little like a panther herself! 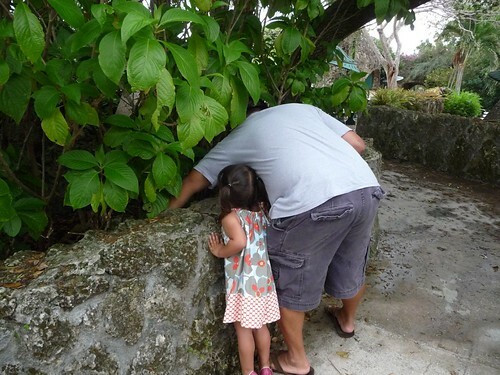 Check for her distant relatives in the Everglades. 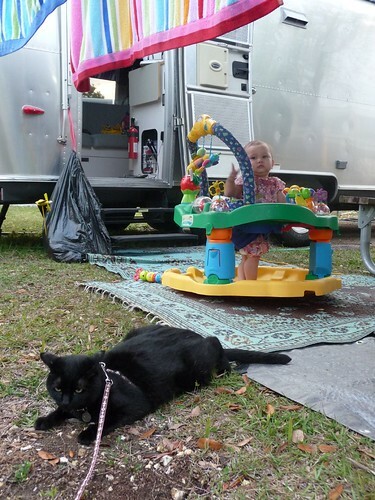 I thought maybe Yoda WOULD actually like meeting some local panthers and potentially getting adopted into their clan. It would probably be much more exciting than being couped up in this tin box for months on end 🙂 Although they probably wouldn’t provide her with the “3 hots and a cot” type prison fare we are serving up for her here. That little play saucer is like a garden gnome. Every time it shows up in a picture from some far off land, it feels like a little wink. I can hear the music in my head. The middle caterpillar tune is my fav. Looking forward to seeing y’all soon.